One of these days, I would like to be paid for my music journalism efforts. Aside from modest income from my book sales (still available on Amazon, among other places by the way), I have not reaped any financial benefit from my efforts. My obsession with music, bands, concerts, etc. is – in a nutshell – a deeply immersive hobby. I am well aware of the difficulties associated with such an ambition. Simply put, there isn’t much of a market for music journalists in this day and age. To be certain, next to no one can make a living from doing that and nothing else. That is also where I may have a leg up: I don’t need writing to be my primary income. I am just this side of retiring from my day job, which I have been doing for almost 25 years. If all goes well, there will be benefits to reap, and a pension to be gained. Provided I do things correctly, a couple of major expenses will be taken off the post-career board, making it much easier to live a life where a large influx of money will not be necessary. This is what will enable me to pursue the life I desire. I have always been one of those people who said he didn’t want to turn his hobby into his job. Yet that appears to be exactly where I’m headed. For many, this would be cause for concern. Luckily, I’m a man of many interests. I have plenty of other things to keep me amused should I pursue my quest to write about music. I can play my guitars. They have been sitting on their stands, along with a newly designed effects pedal board, waiting for me to give them attention. The three small amplifiers I own also demand attention. Not long ago, I challenged myself to learn some jazz and fusion favorites, strictly for my own amusement. But I’m also making friends who play in bands, and it would be nice to drop by and sit in. For that, I need the time to practice. I can reunite with my golf clubs. Writing my book took my off the course for the better part of two years. I’ve sworn to myself I will be going back this year. It will be nice to walk around in the sunshine again, particularly if it doesn’t involve responding to a crime scene. Golf is also a nice way to make new friends after I move. I have no intention of becoming a hermit. I love going to the movies, or just watching them at home. There are few things better than being able to turn my brain off for a couple of hours and let someone else do the story telling. There are more than a few blu-ray and DVD discs on my shelves. I should have no problem staying amused. And let’s face it: I can’t imagine myself referring to reviewing albums, conducting interviews, writing features and books, and attending concerts as “work,” no matter how much effort and time it takes. I really enjoy doing it. Someone wiser than me once said, “The man who does what he loves for a living never works a day in his life.” I find that to be both accurate and comforting. In the end, I like where things are headed. 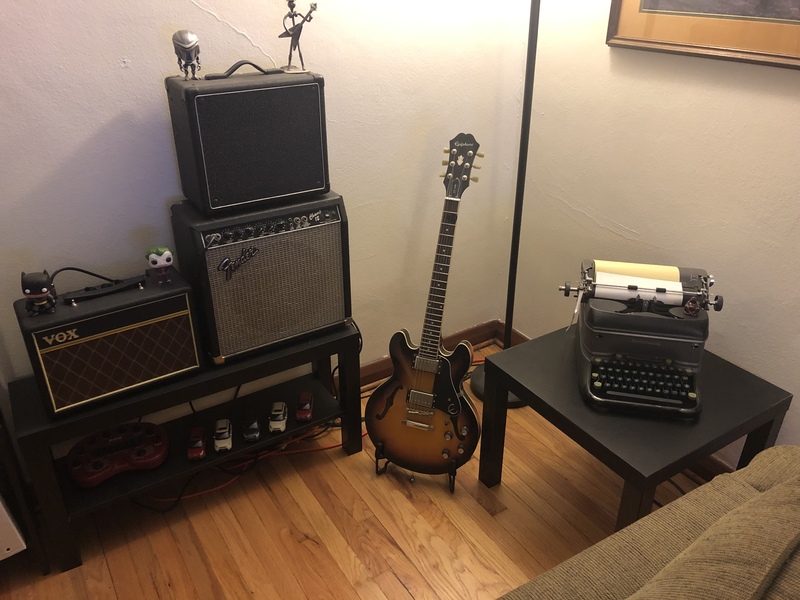 I enjoy the idea of my “office” being the second bedroom of my condo, where I can casually stroll with a nice cup of coffee in hand, readying to explore a day’s worth of music. Later that evening, I can make my way to a club to catch someone’s set, which I can write about the next day. Not a bad career move at all. You and I are on a similar trajectory, but I think I’ll pass on the golf clubs. Growing up in the home of golf meant every kid got a set of clubs whether they wanted them or not – my folks wouldn’t even let me sell mine, because they figured it would come in handy for job promotion. Ironically, when I did come to sell them 30 years later, it was back to the same guy who sold them to my parents! I’ve already started cutting back on buying albums this year, to experiment on a lower income, and it’s going fine. I’ve 40 years of albums that I’m enjoying, and while there’ll always be room for a few new strays, It’s nice not to feel the pressure of trying to keep up. And y’know what? My best writing comes out of the blue, on a whim. So it’s kinda nice to put the brakes on, shuffle through the thousands of albums each day, enjoy an album for the sheer pleasure of living in the moment with no lists, and suddenly experience that lightbulb moment when you least expect it. Now that’s what I call a retirement plan!